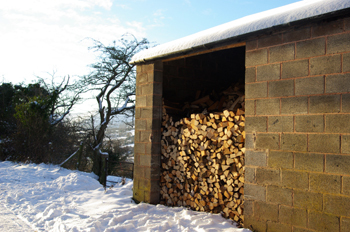 WIFI everywhere, well-stocked accommodation, powerful wood stoves, good dry logs. Life's easy here: plenty of time to enjoy games tournaments, movies and walks from the door. Imaginative grounds for pottering and sitting including our vineyard, and a beguiling Beth Carter statue of the cat-child! 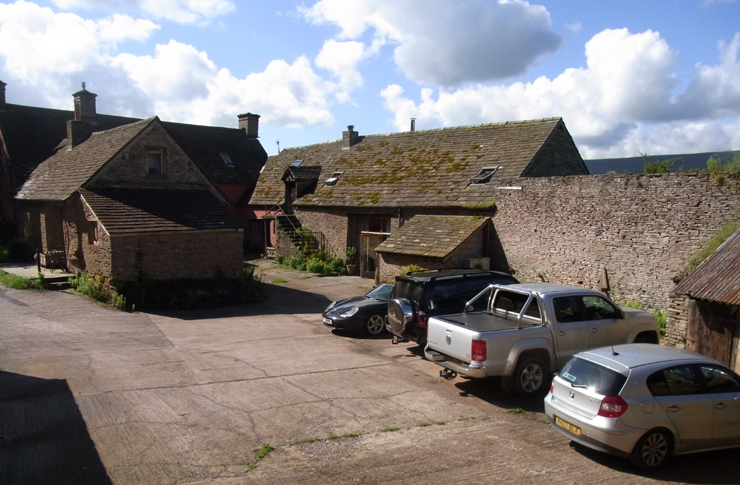 While Dukes Farm has unlimited parking, and wondrous, complete, tranquil quiet with outstanding starlit skies (just yards from the Brecon Beacons Dark Sky Reserve), it's far from dull! There's a games room and large sunken trampoline, lovely gardens and walks from the door. We're in walking distance of the mountain ridge, Offa's Dyke, and both local pubs. 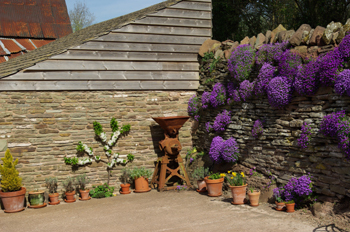 Dukes Farm aims to be a welcoming canvas & palette of colours for holidays of every hue. And we're child friendly, pet friendly, just really friendly. Each of our accommodation has all that you will need to settle in just like home. 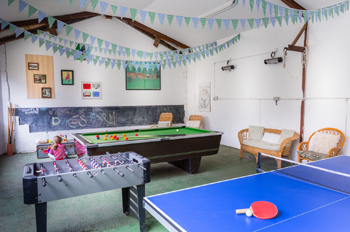 In the games room there's a full size pool table, competition standard table tennis table, dartboard (bring your own darts) and table football. 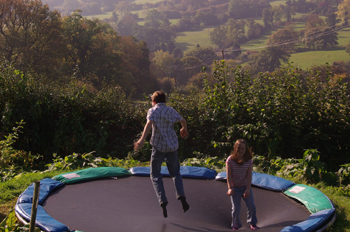 Each property has a south-facing terrace with a barbecue and/or firepit, plenty of outdoor seating and there's a 14-foot trampoline sunk in the garden. If the weather fails you, there is also a great library of books, toys, games and DVDs. 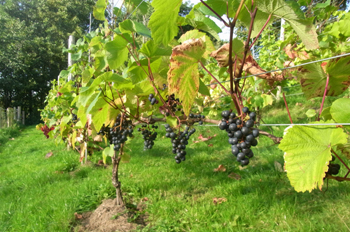 The gardens and vineyard are full of interest, but should you want to roam further, you can walk from your door over our 50ha farm, with panoramic views in every direction: not only of the Black Mountains themselves - the Cats Back, Hay Bluff, Hatterall, the Darrens - but also further afield to the Radnor Hills, Clee Hill, the Mynd, the Malverns, May Hill, and the Skirrid with its step 'where the devil landed'. 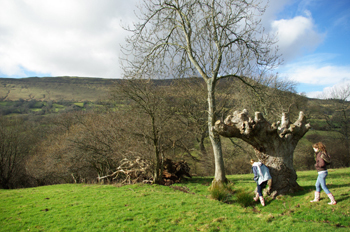 The farm has a 6ha restored upland meadow, a stretch of the Monnow river, and several woodlands, both ancient and newly planted. There's a farm map to guide you to our Bronze Age burial chamber, and there's also An Historie of Cressewelle in every cottage to bring our local story to life. Just as the shower rooms are stocked with loo roll, toiletries, soap & flannels, so the kitchens have a tea cosy, oven gloves, kitchen towels, dishcloths, scissors, dishwasher tabs and cleaning materials. They're replenished with basic stuff for every stay: pepper mill, sugar, salt, oil, teabags, coffee, and ice in the freezer. While all the supermarkets deliver here regularly (Asda, Tesco, Sainsbury from Hereford, Waitrose from Abergavenny), we also pop a pint of milk in your fridge, and packet of (best, artisan) biscuits in the jar to welcome you. The homely boot room houses all kinds of information and useful items to borrow: maps, tourist leaflets and walking books galore, (many based around lively local free-house pubs), iron, ironing board and hair dryers, spare wellies, coats, suntan lotion, mending kit, vases, stock cubes and extra garlic. It also has a landline and paybox, as there's no mobile coverage so close to the mountain. If you're a large party (8+) and prefer not to cook, our local catering company will deliver delicious hot meals to the door from their family or celebration menus. It's a great way to eat out while staying in! And if you prefer not to cook or babysit, there is a twin bedroom with en suite facilities in the main farmhouse for your nanny, chef or carer. Contact us for details.